How Do You Attain “Sustainable Peace” Amidst Rising Military Conflicts? But the task ahead was overwhelmingly difficult: How do you advance peace and development against the backdrop of political unrest in parts of Asia and Africa and continued conflicts in the Middle East— all of them amidst rising global military spending triggering arms sales running into billions of dollars. 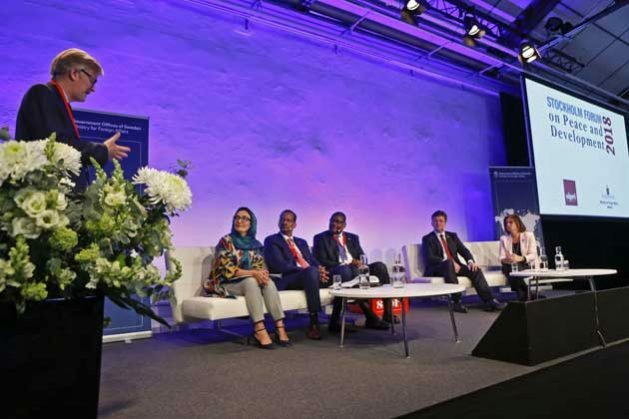 In his opening address, the chairman of the Board of Governors of the Stockholm International Peace Research Institute (SIPRI) Jan Eliasson set the theme for the three day meeting when he declared: “No peace without development and no development without peace”. “And none of the above without human rights,” said Ambassador Eliasson, the former Deputy Secretary-General of the United Nations. The three-day meeting, May 7-9, was attended by more than 350 political leaders, high-level policy makers, academics and representatives of civil society organizations. In his keynote address to the plenary, the President of the UN General Assembly (PGA) Miroslav Lajcak underlined the new UN concept of “sustaining peace” which has been the focus of two resolutions, one by the Security Council and the other by the General Assembly. “It has spurred new initiatives. It has got us all talking – and acting,” he said. And, two weeks ago, the UN hosted a High-Level Meeting on “Peacebuilding and Sustaining Peace”. The meeting showcased some best practices. “We learned about how we are moving from stand-alone actors or activities for peace, to pooling our assets”, said Lajcak, who is also the Foreign Minister of Slovakia. The other featured high-level participants at the Forum included Margot Wallstrom, the Foreign Minister of Sweden, Isabella Lovin, the Swedish Minister for International Development Cooperation and Climate Change, Gbehzohngar Milton Findley, Foreign Minister of Liberia, Adela Raz, Deputy Foreign Minister of Afghanistan and Hassan Hussein Hajji, Minister of Justice of Somalia. Meanwhile, a new SIPRI report, released last week, highlights the rise in global military spending at a time when there is widespread speculation about a new cold war between the United States and Russia. And US President Donald Trump’s public war-mongering and military threats against countries such as Iran, and until recently, North Korea -– is also likely to escalate military spending further. And, most visibly, the continued conflicts in Syria and Yemen and the instability in Iraq, Libya and Afghanistan, have triggered a rise in arms spending and bolstered US and Western arms sales to the war zones in Asia and the Middle East. For 2017, he said, global military spending remained stable for yet another year. However, this happened at a time that Russia had to decrease its military spending due to the bad economic situation in the country and the year after Saudi Arabia had cut its spending a lot, he explained. “If those two countries will maintain ambitions to improve their armed forces, we can expect they will increase military spending as soon as their economies improve,” Wezeman predicted. Saudi Arabia started to increase its spending in 2017, despite the continuing low oil prices. At the same time there are no indications that China will end the long lasting steady annual increases in its spending. The decrease in US spending ended in 2016, according to Wezeman. Trump has pushed for increases and a substantial increase in 2018 is likely. Finally, many states in Europe have started to increase their spending in response to heightened threat-perceptions towards Russia, and in relation to the conflicts in the Middle East. On the contrary, doesn’t it appear that spending will also keep rising in the context of a “new cold war between the US and Russia? He pointed out that the heightened tensions between the US and most of Europe on one side and Russia on the other are a clear motive for increased military spending. However, rivalry between major states in the Asia Pacific region, roughly China on the side and the USA, India Japan on the other are also a major element, he declared. In its report, released May 2, SIPRI said total world military expenditure rose to $1.7 tillion in 2017, a marginal increase of 1.1 per cent in real terms from 2016. After 13 consecutive years of increases from 1999 to 2011 and relatively unchanged spending from 2012 to 2016, total global military expenditure rose again in 2017. * Military spending in 2017 represented 2.2 per cent of global gross domestic product (GDP) or $230 per person. ‘The increases in world military expenditure in recent years have been largely due to the substantial growth in spending by countries in Asia and Oceania and the Middle East, such as China, India and Saudi Arabia,’ said Dr Nan Tian, Researcher with the SIPRI Arms and Military Expenditure (AMEX) programme. ‘”At the global level, the weight of military spending is clearly shifting away from the Euro–Atlantic region”, he added.